The Windows Cloud OS called Windows Azure that had been under the code name Red dog project for a long time has been officially announced in the keynote by Ray Ozzie on the first day of the PDC in LA (27th Oct 2008). I blogged about coming across the name Windows Strata previously but this turned out to be a red herring, Strata name have never been confirmed by anyone in Microsoft. 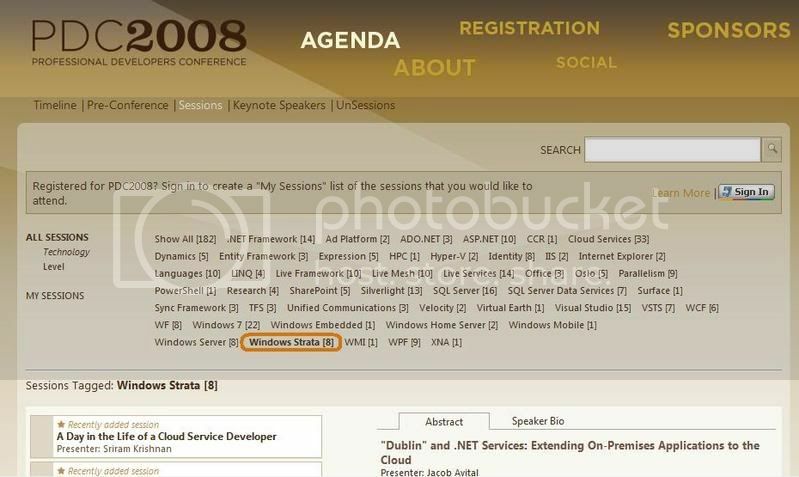 The PDC sessions technology category "Windows Strata" is what made me previously suspected that this is the new name of the Windows Cloud OS, see screenshot below. This technology name were removed shortly afterwards from the sessions list.